Ocean Trout (Oncorhynchus mykiss) are similar to Brown and Rainbow Trout. They have a large jaw with numerous reddish or black spots along the body. In Tasmania, they can grow up to 90cm and 14kg but are generally harvested at about 30-45cm and 1kg. They are predators with a varied diet, and will eat nearly anything they can catch. The Ocean Trout is a native to the cold waters of the North Atlantic Ocean and was introduced to Australia in the nineteenth century. 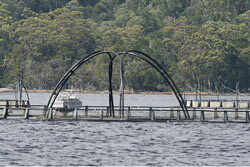 Ocean Trout is presently farmed in sea cages in Tasmania (e.g. Macquarie Harbour). Their life cycle and farming is very similar to Atlantic Salmon. Young trout of about 400g are transferred to sea cages and reared to a size of 2.5 -3.5 kg. Ocean trout are similar in taste to Atalantic Salmon but it is more subtle and less salty. They are oily fish with a firm rosy pink/orange flesh and mild flavour. They have a high fat content and are rich in omega 3 oils. Tasmania produced 14 292 tonnes of Atlantic Salmon and Ocean Trout (head on, gilled and gutted), valued at $111.5 million at the farm gate, in 2001-02. Ocean trout is versatile to cook with. Steaming, poaching, smoking, grilling and barbecuing are popular cooking methods for trout, but for excellent presentation and ease of preparation probably the best method is to bake and serve them whole.